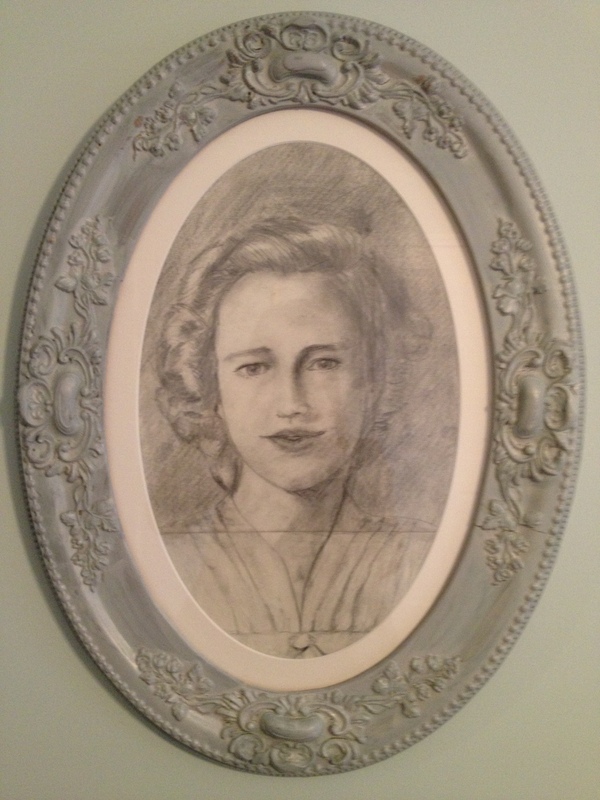 Pencil sketch: I drew this portrait of Grandma Edna Allen when I was somewhere around 14 I think…didn’t know much about composition at the time, obviously. It has floated around for years, you can see a few stains here and there. Mom asked if I would add her dress on, hence the seam, I still had the same notebook I used back then so it wasn’t too difficult. After carefully taping it together, my dear hubs cut a piece of plexiglass to fit the frame she wanted to use, Hobby Lobby cut a mat for me. Amazing how difficult it is to find an oval mat, or someone who cuts them. Wow. This is stunning and I love the story that goes with it. Beautiful!!! That is amazing! You have some serious talent!! Julie, this looks exactly like I remember her. Such a wonderfully sweet lady, just like your Mom. I would spend the night with your Mom and we would have fun painting.